The GSW dataset contains many data layers that present the surface water data in different ways. We will start by visualizing the water occurrence layer, which provides a summary of where and how often surface water occurred over the entire time-period between March 1984 and October 2015.
show how to refactor the script to make it more readable and maintainable. The first statement references the Earth Engine Image object for the GSW dataset, and stores it in a variable named gsw. The second statement selects a single layer of the GSW dataset, and stores it in a variable called occurrence. 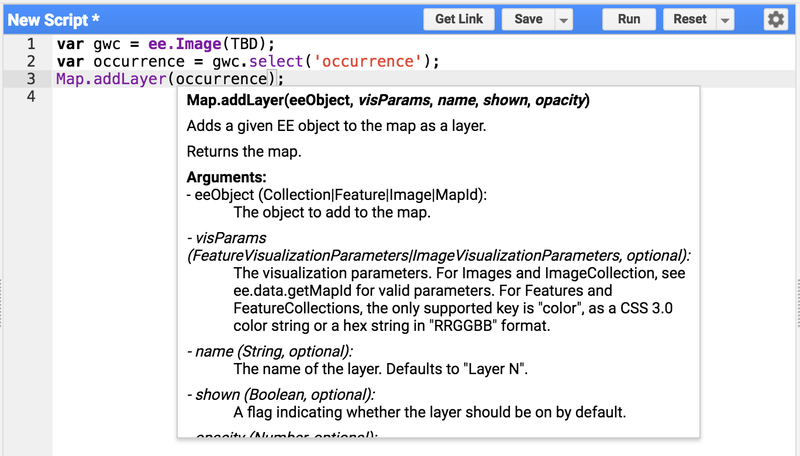 The third statement adds the occurrence image to the Code Editor's interactive map. 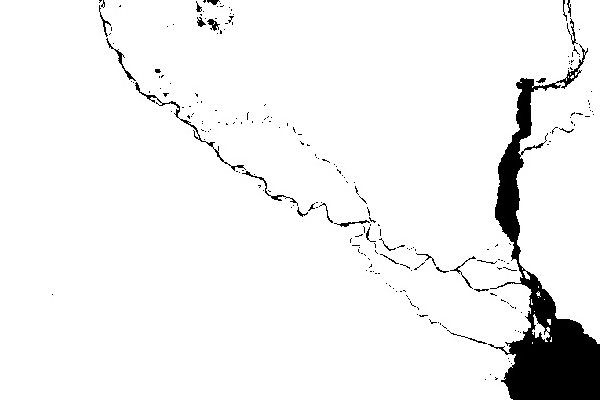 Click on the Code Editor's "Run" button, and after a few seconds you should see a map with grey coloring along the coastlines, similar to Figure 1. Figure 1. Default visualization of the global surface water occurrence data layer. 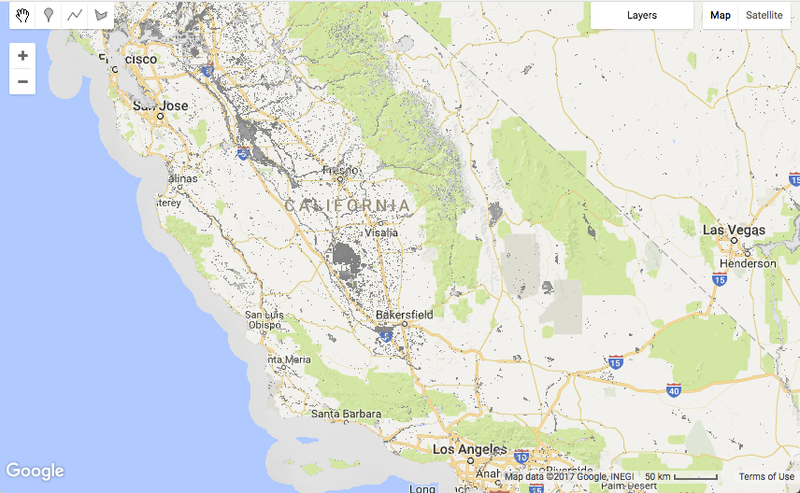 In most areas, the GSW dataset appears transparent, because locations where either Landsat images were not collected (i.e. ocean areas) or where water was not detected by any observations in the 32 years are masked out. To explore values of the water occurrence layer, we will use the Code Editor's inspector tab. First click on the inspector tab, then click on the map to select a location. The inspector tab will display information on each of the layers that are present where you clicked. Figure 2. Example Inspector tab output. In the example above, the value of the layer named value is 98. The units are percentage points, so approximately 98% of the time the location was classified as water covered. The value is the average of each of the monthly surface water occurrence values, which normalizes against seasonal variation, as described in the Data Users Guide (v2) . Figure 3. Screenshot showing the addLayer method's arguments. Run the code again to make sure it still works after the refactoring changes. The resulting map should remain unchanged. Next, we will work on improving upon the default visualization parameters, which are making our water appear gray. Add a new statement that creates a variable VIS_OCCURRENCE and pass it as an additional argument to the addLayer method. The visualization parameters stored in JSON structure VIS_OCCURRENCE indicate that red should be used for a minimum value of 0% and blue for a maximum value of 100%. The addition of .updateMask(occurrence.divide(100)) causes the opacity/transparency of the pixels to be set based on the occurrence value. Run the script again, and view the revised results from our styling changes. Figure 4. Screenshot of water occurrence for the Paraná Delta near Buenos Aires, using a transparent red color for the 0% minimum value endpoint and a solid blue color for the maximum value endpoint. The water areas are now blue! Progress! The water occurrence image contains information on how often water is expected using a range of values from 0 to 100%. However, it is often useful to define a binary water layer (i.e. "water" vs. "non-water") based on a certain percentage of occurrence (i.e. a threshold value). We will use this simple binary layer as a clean background layer over which other GSW layers can be placed. Creating this threshold layer can be done using the following statements, which uses a threshold value of 90% to separate water and non-water. And finally, and the layer to the map. In order to have this layer rendered under all other layers, place the following statement before any other Map.addLayer statements. Figure 5. 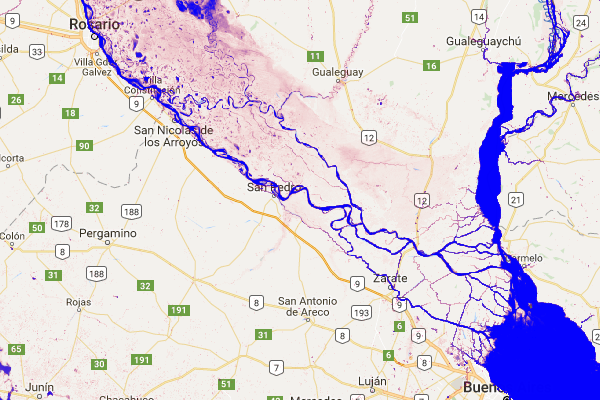 Screenshot of a 90% water mask for the Paraná Delta near Buenos Aires. It is fun to explore the world by panning and zooming around, but the world is large and sometimes it helps to jump directly to a particular location. Here is a series of statements that provide a small sample of interesting locations, in terms of surface water. Just uncomment one of the statements at a time, and your script will go to that location when it is run. // Uncomment one of the following statements to center the map. This is just a small sample of interesting locations. Feel free to add your own! Before we move on to the next layer of the GSW dataset, we are going to do a little more code refactoring. Specifically, we will group our similar statements together, and add some comments that will break up our code into sections for assets, constants, calculations, centering the map and adding map layers. In the next section, you explore how water occurrence has changed over time.